Holiday shopping came early, and expensive, this season! Neiman Marcus has unveiled the 88th edition of its lavish and beyond outrageous fantasy catalog, featuring luxurious gifts that anyone would want to unwrap. Here are nine of the most extravagant presents from their annual book — including the most expensive one, which is fragrant. Try not to get too jealous that none of these will have your name on it — it is a fantasy gift guide after all, so most of these are out of anyone's wildest dreams. Ever wanted the world's coolest cocktail machine? This is it. The 6-foot tall Imperial Shaker oozes authenticity, from its cast iron, brass, copper and silver materials to the elliptical shake created by the crank. Not only do you get a one-year supply of Tanqueray No. Ten®, but you also get a personal cocktail education session for up to 20 guests with a Tanqueray mixology expert is included. Forget going out for cocktails anymore, you're set. Forget having to share jet skis or ATV on your next vacation — you can now have your own. Hailed as the world’s best high-speed amphibians, these machines convert from water cruisers to land lovers in just under five seconds. And if you're in a rush, your Quadski can accelerates up to 45 mph on land or water. If sleeping or eating on the finest linens is your idea of a dream come true than this package from the Leontine Linens Home Trousseau is the present for you. Your induction to true luxury living begins with a personal in-home visit from founder Jane Scott Hodges where together, you will select bed, bath, and table linens for every room in your house to create a perfectly appointed home. Have the best lawn on the block! Event planner Preston Bailey is going to turn your ordinary space into something truly magical by making you a glorious garden peacock. Pick between a 6-foot tall garden version with a 10-foot long tail comprised of silk flowers and seasonal plantings, or a 3-foot tall indoor version with a 5-foot long tail made of silk flowers. Either way, your house will outshine your neighbor's. Forget the everyday Maseratis, splurge on a limited-edition one. Named after the North African wind, the Ghibli is very powerful. The twin-turbo engine (produced in collaboration with Ferrari) catapults you from 0 to 60 in 4.7 seconds, and has all-wheel drive. The car is one of 100 vehicles built to mark the Italian car company’s 100th anniversary. This gift offers a one-of-a-kind locket, and a European trip. The three-day journey begins in the historic German town of Idar Oberstein, home to some of the world’s finest gemstone cutters. You and Monica Rich Kosann, jewelry designer and photographer will select a stone and collaborate on your creation. The final version and a hand-painted rendering of your piece, will be sent home. If Mardi Gras has always been a dream, there’s no better time than February 2015 to experience the city’s ultimate carnival. Hosted by noted New Orleanians, this five-day adventure offers a truly authentic, luxurious experience for you and five of your favorite couples. You’ll stay in the heart of the French Quarter at the opulent Audubon Cottages, enjoy world-class dining experiences, get behind-the-scenes tours of local art galleries and attend a private concert and dinner at the legendary Preservation Hall. But the best part of the trip is your Lundi Gras evening ride in the spectacular Orpheus Parade, followed by the black-tie Orpheus Ball. Laissez le bon temps rouler! Maybe you never had a race car worthy of the world’s most notorious tracks, but you’ve certainly dreamt of driving on one. Now, the checkered flag are yours with this 100 percent authentic 1:32 scale model of your favorite track. Iconic structures, pit crews, period slot cars and more help get you into the action while integrated track cameras capture and display it on mini screens. Racing legends, such as Vic Elford and David Hobbs, will co-host your inaugural race-night party. Gentlemen, start your engines. Pack your gown and tux because you and a guest are cordially invited to play the part of Hollywood royalty during the film industry’s most celebrated weekend. The star treatment begins Friday at the luxe Peninsula Beverly Hills Hotel (your home for the next three nights). Saturday’s agenda is packed with special excursions, drinks at the famous Sunset Tower, and dinner at Chateau Marmont. Oscar day kicks off with pre-party spa pampering (followed by hair, makeup, wardrobe styling and jewelry loan) and culminates with invites to the night’s most coveted event: The Vanity Fair Party, where you’ll mix, mingle and revel with silver-screen legends past and present. Everything from your clothing to the decor in your home suits you perfectly. Isn't it time you had a signature scent that does the same? Your quest to fragrance utopia begins with two first-class tickets to Paris close to the Fontainebleau, where you’ll meet with sixth-generation Master Perfumer Olivier Creed to create the ultimate custom scent. While in The City of Light, you and a guest will dine with Creed, enjoy five-star accommodations, white-glove car service, private tours and other experiences befitting the royally amazing you. A few short months later, a fragrance nonpareil will arrive at your doorstep in 24 14-karat gold-gilded six-liter flacons and 12 14-karat gold-accented leather atomizers featuring your bespoke scent. The 88th edition of the Neiman Marcus Christmas Book carries on the department store's tradition of featuring extravagant gift ideas for the holiday season. 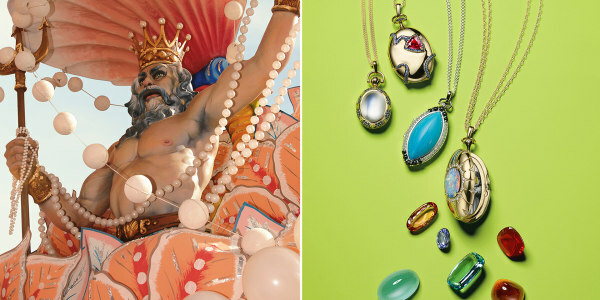 From the "Ultimate" Mardi Gras experience, to a one-of-a-kind locket, take a look at this year's unique offerings.